I have to say this simple dish of Fried Zucchini is probably my favorite way to eat zucchini. 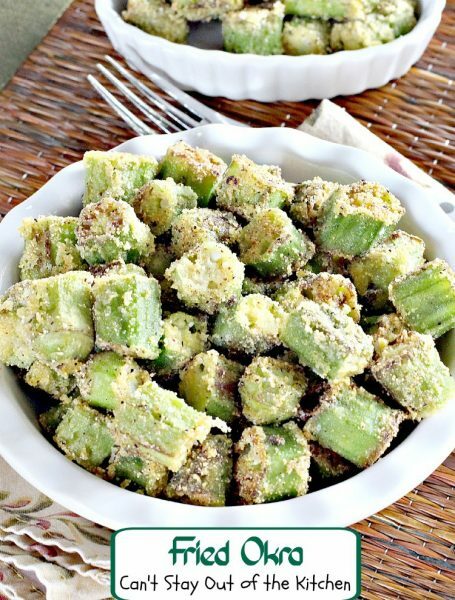 I can make up a batch of this with two or three zucchinis and eat the whole thing myself–and in one sitting! I only use sweet cream butter when I cook (never salted), and I think between that and the cornmeal it adds a little bit of sweetness to the zucchini. Anyway the outcome is fantastic. It has only 5-ingredients: zucchini, cornmeal, butter, salt and pepper. I mean, you can’t get ANY easier than that! Talk about economical! 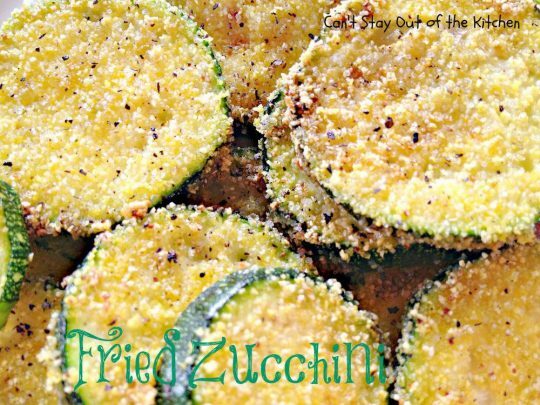 If you’re looking for a new way to use up garden produce or you have an abundance of zucchini from your CSA than consider this very quick, easy, and simple recipe. Even kids can make this easy recipe. All I do is put about a tablespoon of butter (you can use coconut oil if you prefer) in a cast-iron skillet and heat it then I dredge both sides of the the zucchini in cornmeal (real cornmeal, not cornmeal mix), and then saute until lightly browned. Turn zucchini over and saute the other side and then remove to a platter and sprinkle with salt and pepper. SO easy. 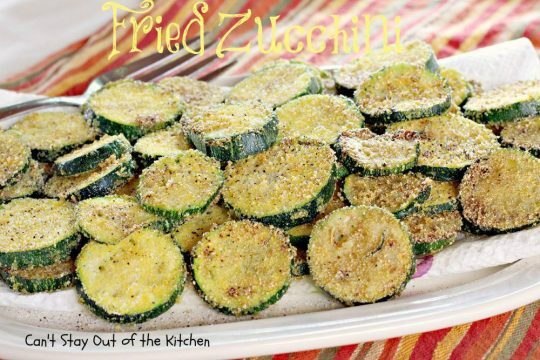 I make this as a side dish a lot during the summer months when zucchini is in season. It’s really fairly healthy and not too heavy on calories either. This gluten free recipe can easily be made vegan by switching to coconut oil to saute the zucchini. The zucchini is just mouthwatering this way. The first time I tasted this heavenly zucchini was when one of our neighbors invited us over for dinner when our children were little and she served this along with steak, grilled onions, salad and pie. We LOVED this recipe and I’ve made it often in the past 30 years or so. 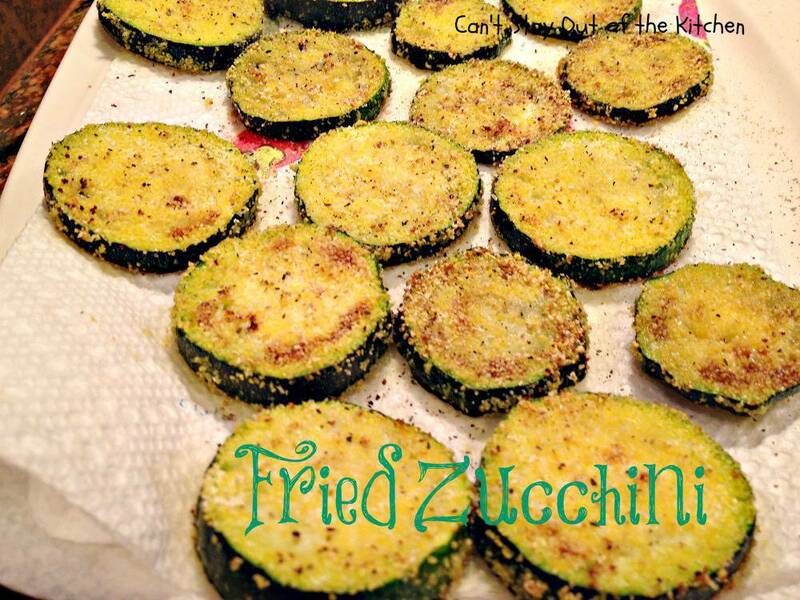 Fried Zucchini is so simple but still very succulent to the taste buds. Why don’t you give this recipe a try sometime soon? 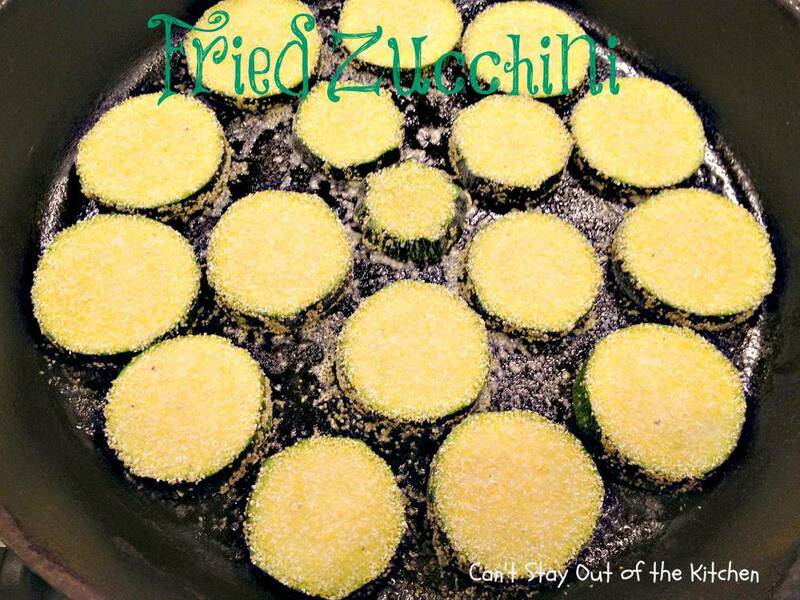 Fried Zucchini is a flavorful side dish that’s a great way to use up garden produce. 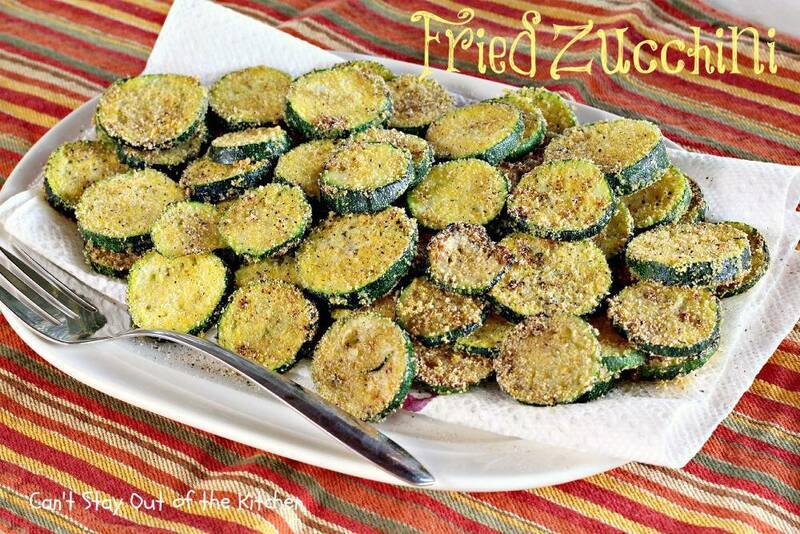 Fried Zucchini really has such wonderful flavor for being such a simple recipe. 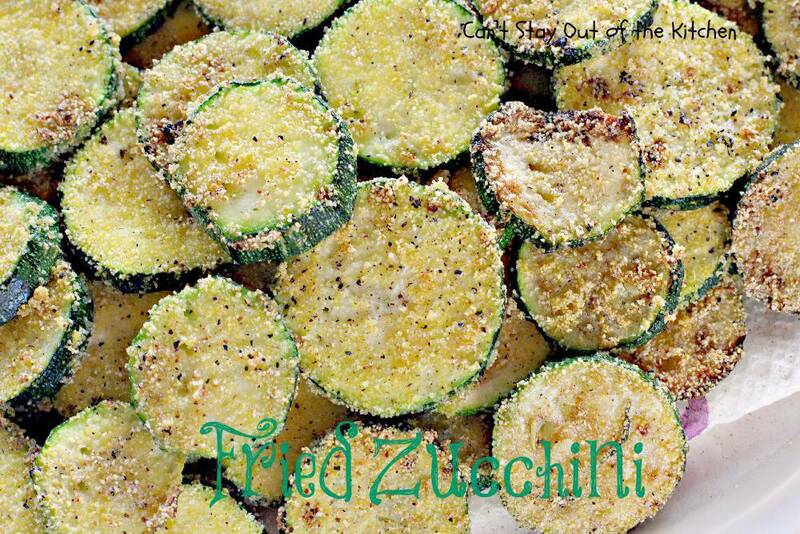 This close up shows the texture of Fried Zucchini. Each piece is dipped in cornmeal, sauteed in butter, and then sprinkled with salt and pepper. To make this vegan, fry the zucchini in olive oil or coconut oil. Start with zucchini. I used 3, but you can use as many as you need. Count on 1/2 of a zucchini for one serving. Wash zucchini and slice down. It is actually good to have the zucchini a little wet because the cornmeal adheres to the surface better. Meanwhile, set your cast-iron skillet over medium heat and add about a tablespoon of butter. Place cornmeal in a bowl. Don’t use cornmeal mix. Dredge zucchini in cornmeal. Here both sides are covered. 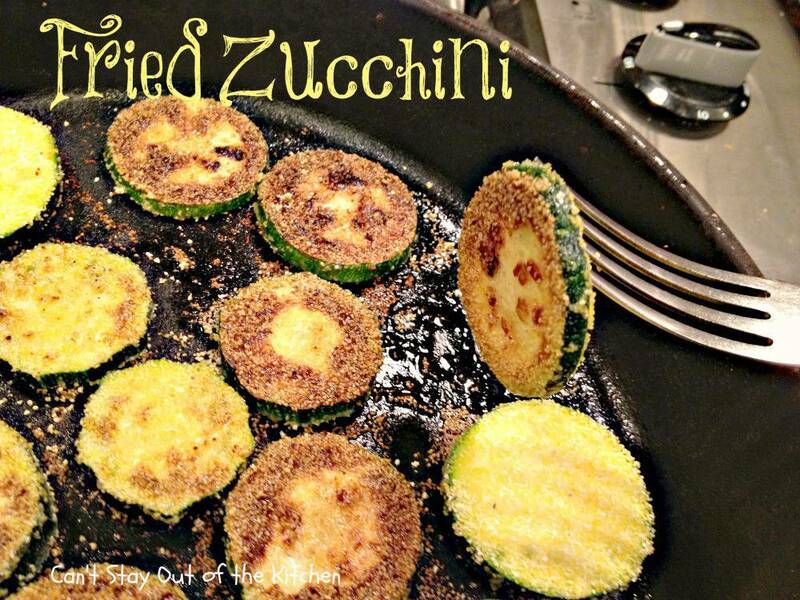 Place zucchini slices in skillet. Approximately one medium zucchini will fit cut down in slices in a ten-inch skillet. Now I’m turning the zucchini over so the other side can cook. I did this procedure actually in four batches before all the zucchini was cooked. I added a tablespoon of butter each time I added another batch of zucchini to the pan. Place cooked zucchini on a paper towel-lined platter. Sprinkle with salt and pepper. We love the delicious flavors of Fried Zucchini. 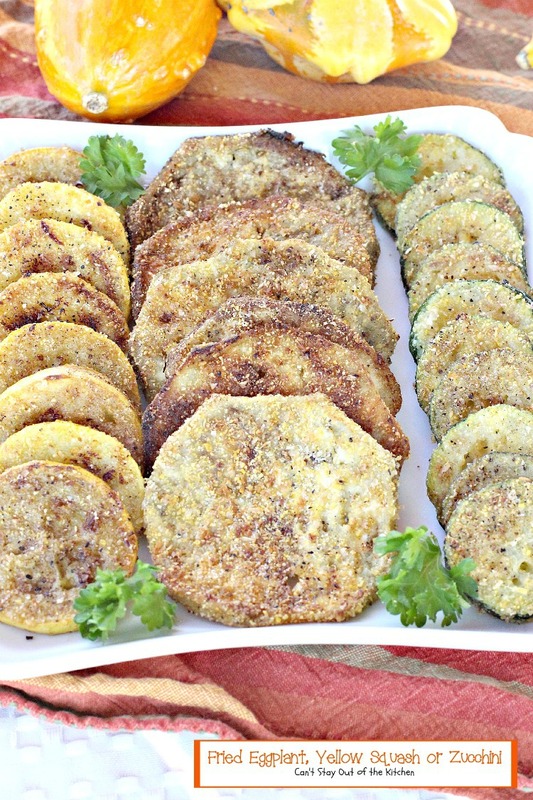 Dredging the zucchini in cornmeal actually provides a sweet flavor to the vegetable. Serve as a side dish with any kind of grilled meat or casseroles. We love Fried Zucchini and make it a lot in the summer when zucchini is in abundant supply, but since zucchini is available year-round, I make this in the winter too. Quick and easy 5-ingredient veggie side dish has a wonderful, savory flavor. Excellent way to use garden produce. Fried Zucchini is gluten free. Heat about 1 tablespoon butter in a cast-iron skillet. Place cornmeal in small bowl. Wash zucchini. 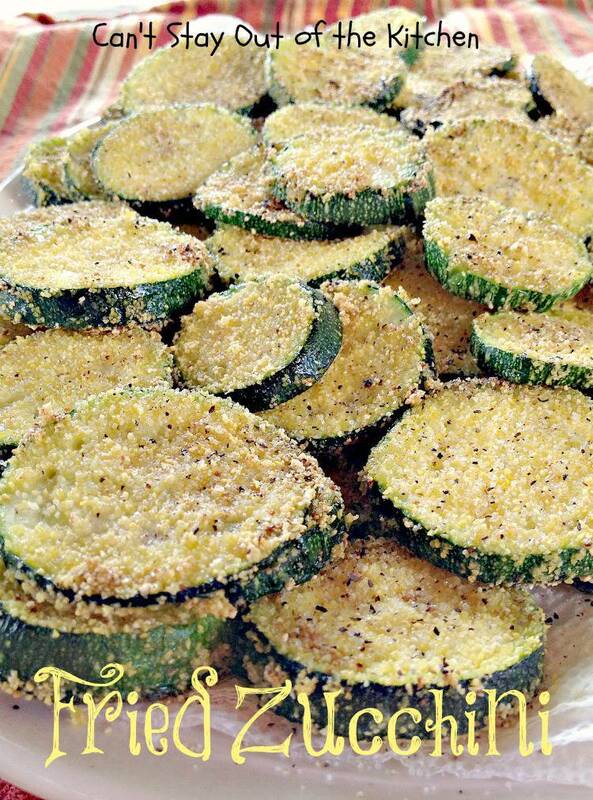 It is okay to leave a little water on it because it makes the cornmeal adhere to the zucchini better. 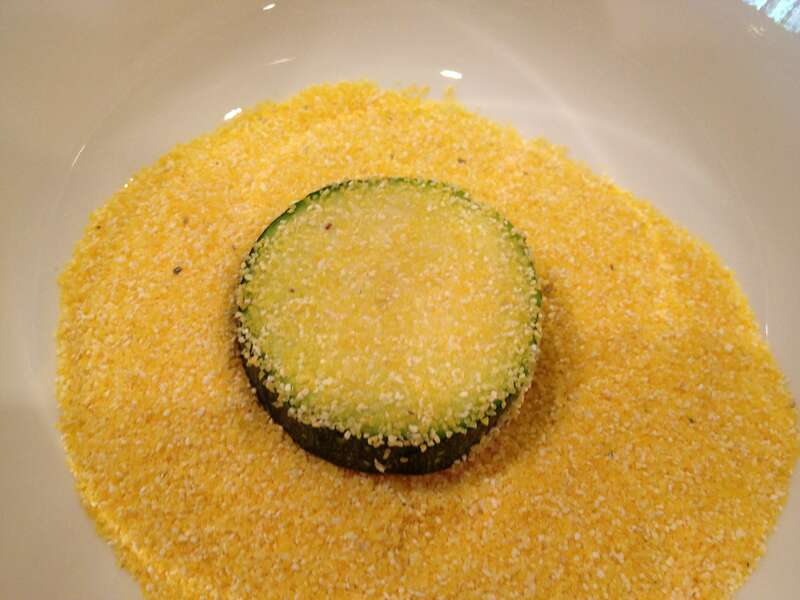 Dredge zucchini slices into cornmeal to cover completely on one side. 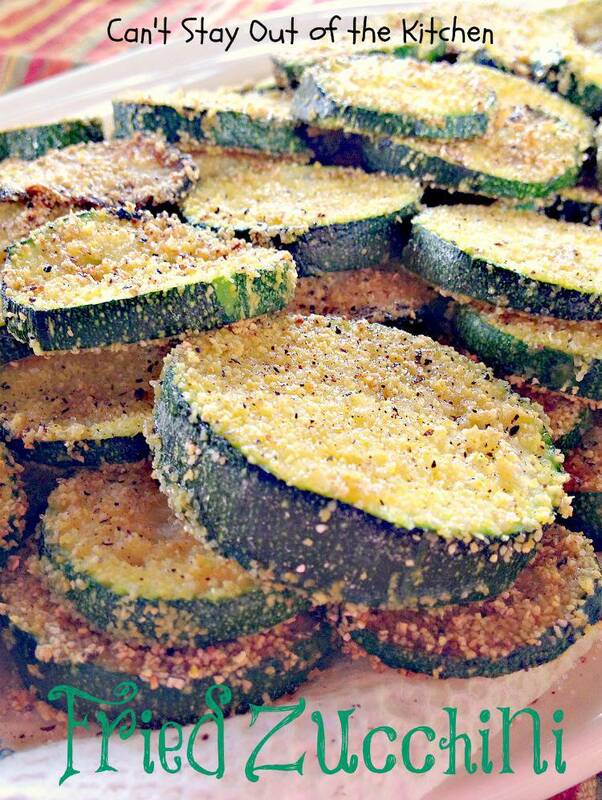 Turn zucchini slices over and coat other side with cornmeal. Cook about 8-10 minutes until the bottoms are light-to-medium brown. 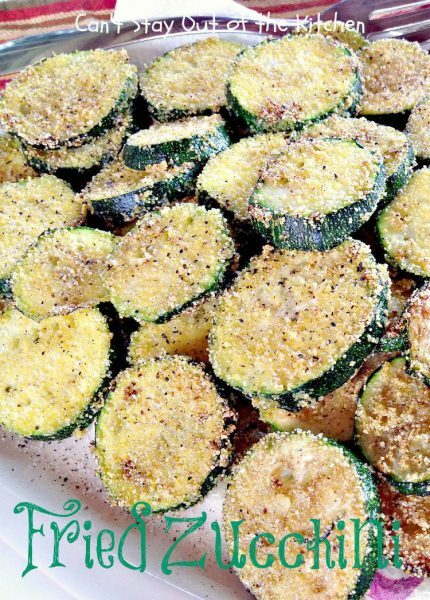 Turn zucchini slices over with a fork. Cook an additional 5-10 minutes or until bottoms are lightly browned. Remove to medium-sized paper towel-lined platter. Heat another tablespoon and repeat the process twice. NOTE: You can usually fit one sliced zucchini in a 10-inch skillet, so you will need to sauté 3 batches of zucchini, each with a tablespoon of butter, until all 3 zucchinis are used. NOTE: This is equally good substituting yellow squash or peeled eggplant, or mixing any combination of all three. NOTE: This recipe can easily be made vegan by using olive oil or coconut oil to replace the butter. You can usually fit one sliced zucchini in a 10-inch skillet, so you will need to sauté 3 batches of zucchini, each with a tablespoon of butter, until all 3 zucchinis are used. [br][br]This is equally good substituting yellow squash or peeled eggplant, or mixing any combination of all three. [br][br]This recipe can easily be made vegan by using olive oil or coconut oil to replace the butter. Depending on how many zucchinis you’re frying it may take 30-45 minutes to fry up all of it, but oh, the succulent, moist taste of the zucchini is worth it! Doesn’t Fried Zucchini look mouthwatering? I can eat and eat and eat this fantastic side dish! Why don’t you come join me? Thanks. I love this stuff and can eat mounds of it! Many many YUMS, Teresa! I want some now. Leftovers?